My Handbound Books - Bookbinding Blog: 2018 Weekly Planner Giveaway! Oh, yes, please! What a generous offer! I'll take any book you make! I don't know why my comment came up as anonymous. Either way, you're still my bookbinding hero. Following on Twitter. Thank you for the chance! What a thoughtful offering. Thank you Rhonda! Lovely journals and would love to have one! Yes, please ! I would love to have one !!! Love the paper binding. If only I lived nearer to attend a workshop with you. Your work is stunning! I have so enjoyed your work and keep them as memorabilia for my family. I'd love a chance to win! They are beautiful books. What a beautiful book. You are so generous and inspiring. Thank you! These are beautiful! Would love a chance to win one. How generous of you to offer these two beautifully marbled books. 2018 would be a special year if one is keeping track with one of your gorgeous books! You are so generous to offer a chance to win one. Love the ebru marnling on the paper. What a generous offer, thank you and I appreciate the list of workshops. I wish l lived in NS so I could take one of your workshops. Love the chance to win one of your precious books. Wonderful planner, I always had a planner in school to keep track of everything. This is nice, always good to write things down. These look gorgeous! Thanks for the giveaway! I love these so much! I love using planners to keep up with my school work and this would be perfect since I haven't gotten a new one for this year, thanks for the opportunity! This is such a great giveaway. I could really use this for work. I love this- I'm a nut for planners, I'd love to win one! I've also shared this giveaway on my facebook page, Low Entry Giveaways so others can enter too! Your planners look gorgeous; whoever ends up with one of these will have a treasure. I've been searching for a planner - and yours are truly unique! Have a joyous 2018! Great looking journals for me to put pen to paper. I love writing things down the old fashioned way in a planner to keep in my purse. It's just easier that way for me. Beautiful, I especially love the second planner. Thank you for this generous giveaway and a chance to win such a lovely planner! This would be great for me! Followed on Twitter too. 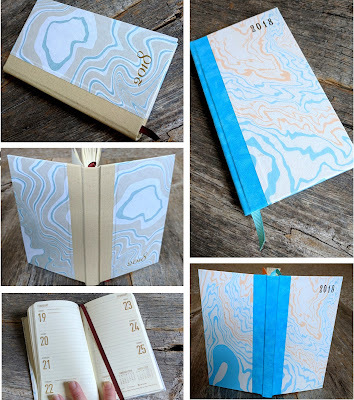 I am excited to make the accordion book, so winning one of your lovely planners would be the icing! Thank you for the chance!! Awesome giveaway. I love having a good planner. I keep track of everything in it plus jot down notes from my day. while I am yet to receive a single giveaway since long time, hope the best and luckiest win this beautiful gift. beautiful planners! thank you for the giveaway! You are very generous to offer such a gift. I know these take a long time to make. Thank you for sharing what you do with others - the ideas on how to do the work as well as your craftsmanship! Beautiful!! I use a planner instead of online always. This would be very cool to have and look at, use and keep. I would LOVE to win!Thankyou!